U.S.-backed fighters stand guard on a building during shelling of the Islamic State's last holdout in the town of Baghouz, Syria, on March 3. U.S.-backed forces fighting ISIS remnants announced the capture of the last of the group's remaining territory Saturday. The Syrian Democratic Forces, a Kurdish-led group supported by the U.S., declared a "total elimination of so-called caliphate" and a complete "territorial defeat" of ISIS. "This is a victory for not just us but the whole world," local SDF commander Adnan Afrin told NPR. There are still reports of sporadic gunfire. Afrin characterizes this as rooting out "sleeper cells" and "cleaning up operations of the towns." 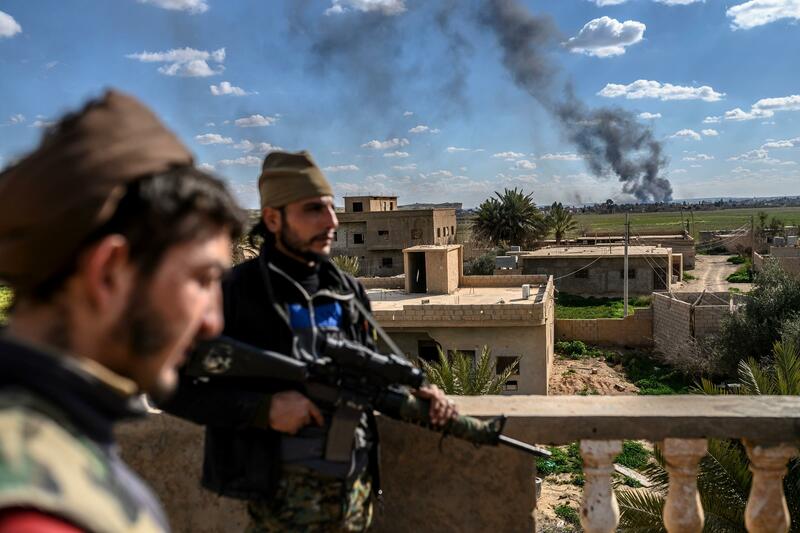 The final battle between ISIS forces and the U.S.-led anti-ISIS coalition centered on the small Syrian town of Baghouz. The capture of the town was slowed out of concern for thousands of civilian hostages. Mustafa Bali, the head of the SDF press office, said in a tweet Saturday that anti-ISIS forces were commemorating "thousands of martyrs whose efforts made the victory possible." Earlier, on Friday, en route to Florida aboard Air Force One, White House press secretary Sarah Sanders had already announced that ISIS' "territorial caliphate has been eliminated in Syria." However, a Pentagon official told NPR Pentagon correspondent Tom Bowman that the president's announcement caught the Defense Department "by surprise." And NPR correspondent Ruth Sherlock in Beirut reported that anti-ISIS forces on the ground told her they were "taken aback" by the early announcement. At one time, the extremist group controlled a swath of Syria and neighboring Iraq the size of Great Britain. It held cities like Mosul and Raqqa with combined populations in the millions. It was able to enforce its authoritarian laws with public beheadings and use the turf to recruit more followers or plan and inspire attacks in the West. The United States was making headway in the war against ISIS under President Obama. President Trump pressed to accelerate the fight, and has made some misleading statements about where things stood. On Dec. 19, he tweeted that he was pulling all of the 2,000 U.S. troops out of Syria because ISIS was defeated. He later backtracked and said 400 troops will remain in Syria. On Feb. 15, he said the group would be defeated within 24 hours. Here are five things to know after the declaration of the defeat of the ISIS "caliphate." U.S.-backed forces have retaken nearly all the small pockets in Syria that were still under ISIS control. But many ISIS fighters are believed to have blended in with the local population, according to U.S. officials. Russ Travers, the deputy director of the National Counterterrorism Center, estimates there are about 14,000 ISIS fighters still in Syria and Iraq. They remain armed and have carried out recent attacks such as the January suicide bombing in the northern Syrian town of Manbij that killed at least 16 people, including four Americans. What's more, ISIS' ideology remains potent and continues to inspire attacks in Europe and Afghanistan. It's unlikely there is a command structure directing terrorist attacks around the globe, but local groups identify as ISIS. President Trump declared in December that all U.S. troops in Syria — some 2,000 — would be withdrawn following the defeat of the territorial caliphate. The decision led to an outpouring of criticism. Defense Secretary Jim Mattis resigned; opposition in Congress was bipartisan; France and Britain, which also have troops in Syria, said they would leave with the U.S. The administration now says about 200 service members will remain in northeast Syria near the border with Turkey and another 200 or so near the Iraq border at a garrison called al-Tanf. France and Britain now say their troops will remain as well. U.S. officials say the troops' purpose is observation and counterterrorism, but their presence also serves to protect Kurdish allies who led the ground war against ISIS. Turkey has threatened to attack those forces, which it considers to be anti-Turkey terrorists. There are thousands of wives and children of ISIS fighters or people loosely connected to the militants whose fate is undetermined and, in many cases, are being mistreated. A recent Human Rights Watch report says in just one corner of the war — northern Iraq — Kurdish authorities are holding 1,500 children under 18 years old in detention and torturing many. Also unknown is the fate of thousands of Western men and women, mostly from Europe but also from North America. About 1,800 women and children from Europe and elsewhere are languishing in detention camps in northeastern Syria. Their countries are hesitant to take them back home because the authorities don't know what to do with them — whether they can prosecute them or prevent them from being domestic security threats once they return. Advocates of those detained say their home countries have a responsibility to take them back and either prosecute them or release them. They also say that letting them languish endlessly in camps just breeds more radicalism. The conditions in Iraq and Syria are still conducive to conflict and extremism. The war against ISIS ended the group's brutal rule but also came at a high cost that will continue to cause suffering. Intensive U.S. airstrikes numbering in the thousands in Mosul, Iraq and Raqqa, Syria, and other cities killed thousands of civilians — though the totals are uncounted. Large areas of cities remain destroyed, with people homeless and living in refugee camps. Major reconstruction is needed and, in the case of Syria especially, there is no plan to undertake it. Many blame the U.S. and allied local fighters for the destruction as much as ISIS. In Iraq, Sunni Muslims say they're abused by Shiite militias that paint them as accomplices of the Sunni extremists in ISIS. Meanwhile, victims of ISIS want revenge. These are the kinds of conditions ISIS exploited when it rose to prominence and started taking over cities in Syria and Iraq a few years ago. In Syria, the U.S. cut money for programs to help stabilize the city of Raqqa and asked other countries, including Saudi Arabia, to pay the bill. The fate of the self-described caliph, Abu Bakr al-Baghdadi, remains unknown. He has been reported "killed" perhaps a half-dozen times. In 2017, a Russian lawmaker said a Russian airstrike "close to 100 percent" killed him. U.S. military officials in Syria believe he is still alive, hiding out in the desert near the Syria-Iraq border, based on communications intercepts and interviews with ISIS detainees. Last August, ISIS released an audio recording purporting to be Baghdadi, but he has not been heard from since. NPR's Lama Al-Arian, Ruth Sherlock and James Doubek contributed to this story.